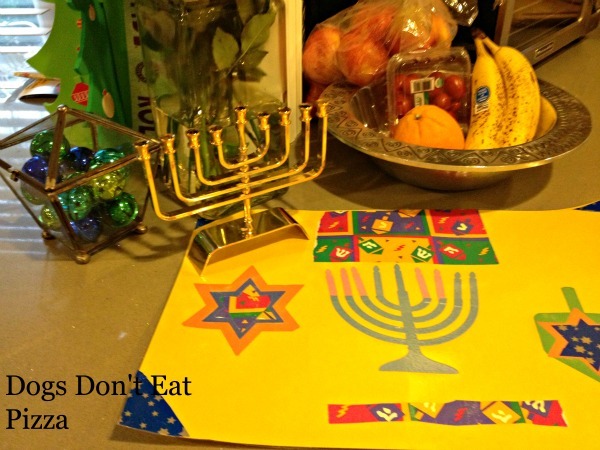 As I explained in this post, we celebrate both Hanukkah and Christmas here at HQ. And that can get a little, ahem, challenging, in terms of decorating. Gotta combine the best of both holidays in one. I thought I’d share some pictures of how we decorate for the holidays here. When you enter our home, you are greeted with a Christmas tree and a menorah. 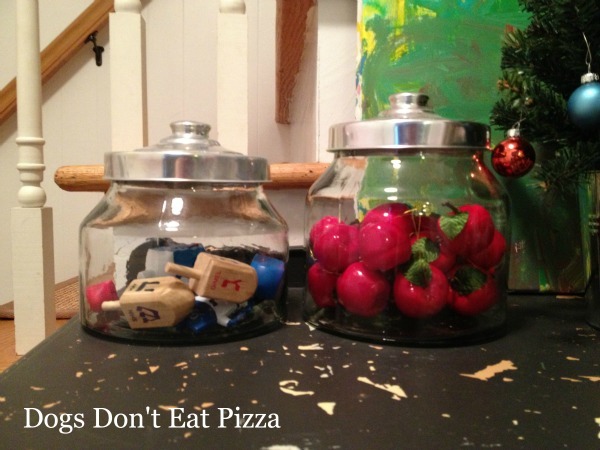 Christmas apples and dreidels. And a welcome sign (made from a piece of slate and chalk). If you don’t know what a dreidel is, it’s a top with Hebrew letters on it. You use it to play a game with gelt, which are chocolate coins. If you don’t know what a Christmas apple is, I’m not sure either, but my mother always had these in our home at Christmas, so I do, too. 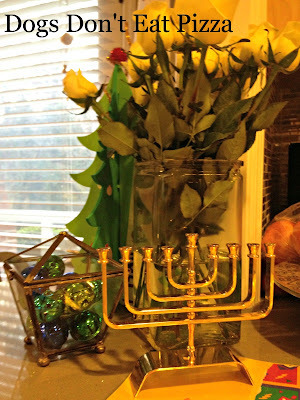 This is the menorah that my mother-in-law gave my son for his first Hanukkah. 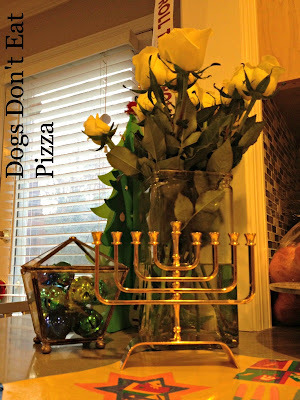 We let the kids use this menorah (we help them light the candles). 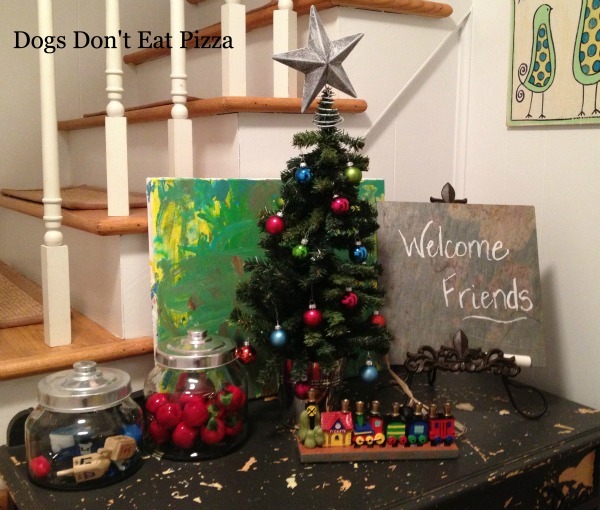 It’s eclectic, but it works for us. On our kitchen counter, we have bells in a terrarium (this post talks about how I made this and other easy and inexpensive holiday decorations) and Dear Husband’s menorah. He got the menorah when he traveled to Israel after he graduated from law school. And roses, because I needed them. They have nothing to do with the holidays and everything to do with me having a rough week. 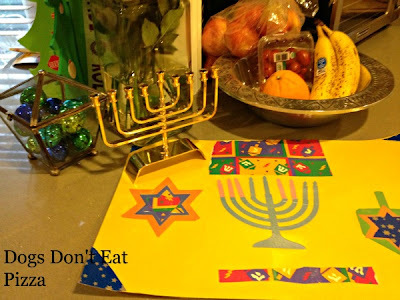 My son made the placemat under the menorah. It’s so bright and colorful. I love it. What do you do to decorate for the holidays? 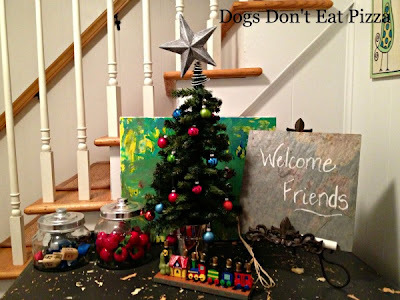 Ha ha I love your explanation of Christmas apples. I don’t know what they are either.